The concept of a nightwatchman in cricket is an enigma. The idea is understandable, since Test cricket is the rare sport where an adjournment in the evening followed by resumption the next day is woven into its fabric. It is counter-intuitive that a batsman of lower ability is sent to bat ahead of more accomplished batsmen in possibly more difficult batting conditions. Yet the nightwatchman is as much part of Test cricket as white clothing, the follow-on, a new ball after 80 overs, and so on. There is inconsistency in the application of the nightwatchman policy. Say, Dean Elgar and Aiden Markram open the innings 30 minutes before close of play. Elgar gets out. Kagiso Rabada walks in. Now, it is almost certain that if another wicket falls, Hashim Amla will walk in and not Keshav Maharaj. It is true that having two nightwatchmen at the crease would throw the batting order out of gear. However, the inconsistency stands out. The next quirk is in the handling of openers. It is near certain that Elgar and Markram would walk in even if there were 20 minutes to go. If the captain was ready to send Rabada just two overs in, why could he not be sent to open? Think back to the SSC in Colombo during the Indian tour of Sri Lanka in 2015. India had secured a lead of just over 100 runs after tea on the third day. Around half an hour's play remained. Cheteshwar Pujara, KL Rahul and Ajinkya Rahane batted in their usual positions and were dismissed. India finished the day at 21 for 3. That India won the Test is immaterial. A judicial change in batting order might have saved at least a top batsman or two. Contrast this to how Don Bradman reversed the batting order in the MCG Test in 1937. If the idea of sending in a nightwatchman is to protect a top batsman from an unplayable ball, that does not wash. An unplayable ball can be bowled at 4.52pm, 10.12am or 1.35pm. In addition, an unplayable ball for Rabada could very well be a normal delivery for Amla. Personally, I believe that the use of the nightwatchman is not founded on a rational basis. If a top batsman is expected to have problems, how can a less skilled batsman be expected to handle difficult bowling conditions? Nightwatchmen have existed right from the first Test onwards. The Australians under Steve Waugh attempted for a while to change this. A top-order batsman was expected to bat whatever the time of the day, and it worked. However, most other teams, and now even the Australians, use nightwatchmen, and the practice has produced many fascinating innings. This analysis is based on the data derived from work I have done on Test batting positions. As part of that analysis, I determined the career Batting Position Average (BPA) of Test batsmen. That index is used here. - A BPA of 1.11 indicates that Alastair Cook has played in the opening positions almost always. Rarely at No. 3 or lower. Both openers are allotted No. 1 as the batting position. - Kumar Sangakkara's BPA of 3.03 indicates that he has played at No. 3 almost always. - Mohammad Yousuf's BPA of 4.64 indicates that he bats in the middle order but has alternated between Nos. 4 and 5. - Harbhajan Singh's BPA of 8.92 indicates that he has played often at Nos. 8 and 9, and that he has batted a lot more at No. 9 than at No. 8. Our interest here is analytical. Let us define a nightwatchman. This is a very difficult determination to make, as there is very little data available on the time of the day a batsman comes to the wicket. So we can only take an algorithmic approach using the BPA and the batting position the batsman batted in. We may get it right 95% of the time. That is enough. A simple starting definition is that a nightwatchman is one who bats (somewhat) higher than his intended position. However, we have to take care of situations such as when Adam Gilchrist opened the innings or Wasim Akram or Darren Sammy came in earlier than usual to speed up the scoring. Gilchrist's BPA is 6.68, indicating that he is a batsman who batted at No. 7 most of his career. Akram's BPA is 8.1. In order to do an accurate job of selecting true nightwatchmen for our analysis, it is necessary to define a number of related parameters in addition to batting position. 1. First, we decide who is not a nightwatchman. Any batsman whose career-to-date batting average is higher than 20.00 cannot be classified as a nightwatchman. No captain is going to risk a batsman of the calibre of Akram (avg 22.64) to protect Ramiz Raja (31.83). Career-to-date averages rather than career averages are taken, since many batsmen, especially the late-order ones, progress or regress in their batting prowess as they move along in their careers: Daniel Vettori and Chaminda Vaas are classic examples. A captain who decides to use a player as a nightwatchman at a certain point in his career might not do so at another point. Vettori moved from being a protector to a protectee. 2. We should ignore players whose BPA is less than or equal to 7.00. If a player normally bats between Nos. 1 and 7, and he moves up, he cannot be treated as a nightwatchman instance. So if a batsman (maybe from one of the weaker countries) with an average of 19 and BPA of 6.2 opens the batting, this does not qualify. 3. We have to look it at the other way too. Only innings played between Nos. 1 and 6 and, and with some tweaking, Nos. 7, will qualify as a nightwatchman innings. A No. 11 batsman batting at No. 8 does not qualify. 4. A key criterion: an innings will be considered a nightwatchman innings if the difference between the batsman's BPA and his batting position exceeds 2.0. For example, a batsman with a BPA of 8.6 batting at No. 6 or higher; a batsman with a BPA of 7.6 opening the innings, and so on. The difference criterion of 2-plus was arrived at after many trials. If the difference was set up at 3-plus, many genuine nightwatchman innings would have been lost, such as when Harbhajan Singh came in at No. 6. 5. The batsman should have played at least ten innings in his career. During the early days of a career, a player's batting position can be arbitrarily determined, which plays havoc with the BPA. 6. The opening situation is special and has to be looked at individually. This is explained later. Based on the above analysis, a total of 646 innings initially qualified as nightwatchman innings. Fifty of these were played in the opening positions. Opening is a dicey matter. Lower-order batsmen are sometimes sent to open for reasons other than that of protecting the openers; in particular, wicketkeepers, who normally bat lower down, have been asked to open for reasons that could be termed whimsical. I went over each of these 50 innings and checked when the late-order batsman took strike, to decide whether it was a true nightwatchman innings or not. Only 17 of these 50 innings fit the bill. Thirteen of those were successful. As recently as 2012, Dhammika Prasad was sent in as a nightwatchman to open the batting. Again, in 2009, Rangana Herath was sent in to open. Both were successful. For the remaining 596 innings, I extracted the end-of-day data segment from the scorecard files, and looked to identify whether the batsmen stayed on till the next morning. This worked well. I isolated 371 instances where nightwatchmen continued their innings on the next day. These were further analysed to fit in the categories "did their job", "moderately successful", and "very successful". Of the rest, most were nightwatchmen innings that did not succeed. In other words, the batsman did not survive until close of play. However, it is wrong to take all these innings as failed nightwatchmen innings. In certain cases batsmen were sent in to speed up scoring (Sammy v Australia, Port-of-Spain, 2012, Roger Harper v England, St Johns, 1986); in others batsmen were sent in ahead of their normal batting positions for reasons unclear (Ian Johnson v England, Leeds, 1956); in still others, late-order batsmen batted in higher positions on the last day in drawn matches (Anil Kumble and Venkatesh Prasad v Sri Lanka, Colombo, 1999). I looked at every innings in which the balls played were above 20. I was able to identify 55 innings as not belonging to the genuine nightwatchman category, and 170 innings as non-opening nightwatchman innings that failed. So we have 558 as the number of qualifying nightwatchman innings. This means that one such innings has been played every four Tests in history. I verified this by checking the period January 1, 2017 onwards, during which there have been 17 nightwatchman innings in 60 Tests. Here is a summary of the numbers. 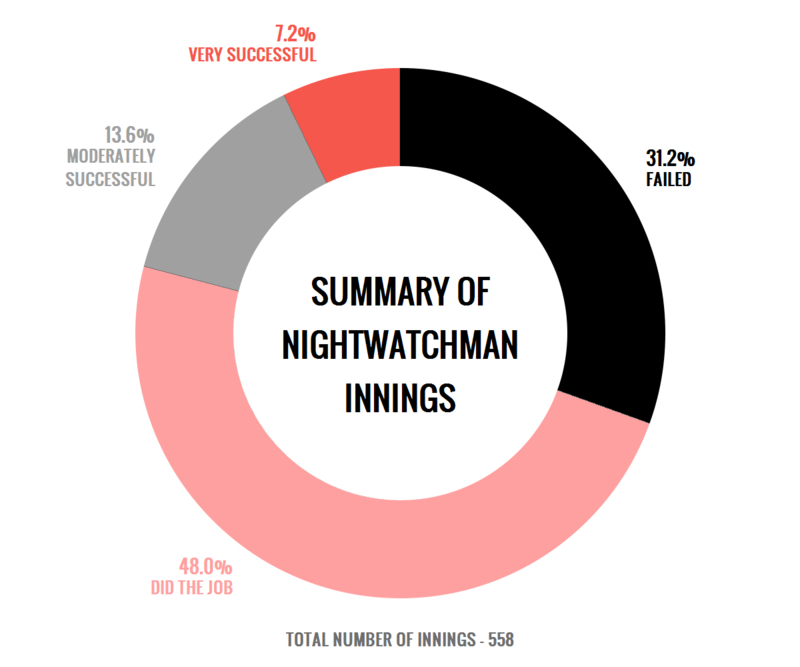 In summary, nearly 70% of the nightwatchman innings succeeded. The batsmen survived to the end of the day. Out of these successful innings, 116 went beyond what was expected and 40 were spectacularly successful. This is a very clear depiction of the fact that the nightwatchman concept has worked out well from the limited point of view of the batsmen successfully completing their allotted task - that of staying on until close of play. However, there are wider ramifications on the following morning. What does the nightwatchman do? Does he continue batting the way he batted the previous day - blocking out balls? If so, he might be depriving the better batsman of strike. A better option might be to score quickly, but is he capable of such a transition in batting approach? What about rotation of strike? Two top-order batsmen (barring a few notoriously bad runners) will usually rotate the strike well and upset the rhythm of the bowlers; the nightwatchman, on the other hand, is likely to offer the bowlers a chance to work on their tactics effectively. Faf du Plessis might have wanted Rabada to hold the fort on the third evening but preferred the attacking skills of AB de Villiers on day four. If Rabada goes on to score 10 in 80 balls on the fourth morning, what can du Plessis do other than break a chair or two in the dressing room? It could mean the difference between drawing and winning a Test match. Of course, if a draw is the objective, the amount of time consumed by the nightwatchman is important. The answers to these questions can be found after a comprehensive study of decisions taken during the last hour of the day. Unfortunately that information is not available anywhere in the scorecard file, and finding it would require an analysis backwards from the end-of-play scores - but then, there could have been bad light or rain towards the end of the day's play, which means the end of the day could well have been 2.25pm. All said and done, while retaining my view that the nightwatchman concept is not really necessary, I cannot but accept that the tactic has been a success from the limited view of surviving until close of play and shielding the better batsmen. Someday I hope to do an analysis of all cases where a wicket was lost with a few overs left and a proper batsman took guard. Then we can compare how the failure rate fares against this benchmark value of 30%. For now, here is a selection of the best nightwatchmen innings ever played. I will do two types of analysis for individual innings. The first is of the top nightwatchman innings in order of balls faced. The table below lists all nightwatchman innings that lasted beyond 150 balls. Eddie Hemmings' 95, fourth on the top innings by size, will be featured in the next section because of its contextual significance. What is common to these ten batsmen: Mark Waugh, Mike Atherton, Desmond Haynes, Dilip Vengsarkar, Mike Hussey, Mohammad Azharuddin, Herbert Sutcliffe, Lindsay Hassett and Damien Martyn? They are an intriguing combination of the elegant and the workmanlike, left- and right-handed, openers and middle-order batsmen - but none of them ever scored a double-century in their careers - a landmark achieved by a late-order batsman, Jason Gillespie. Bangladesh batted first in that match and were dismissed for 197 just after tea on day one. Australia lost Matthew Hayden before close of play and Ricky Ponting adopted the then un-Australian policy of sending in a nightwatchman. Could anybody have predicted that Gillespie, batting serenely, would remain unbeaten for three days, on 5, 28 and 102 respectively. On the fourth day, he got to his double-hundred, Ponting declared with a lead of nearly 400 and Australia duly completed an innings win. Though this was an innings under no pressure, against an average bowling attack, the sheer size of the innings played as a nightwatchman makes it one of the great batting achievements. Gillespie's ten-hour tenure of 425 balls is within the top 250 innings in terms of balls played. His batting average of 15.64 before this innings increased to 18.73 by the end of the Test. Gillespie is the only batsman to have a sub-20 career batting average and a double-hundred. Two ironies about this innings. Gillespie's partner in the huge partnership of 320 for the fourth wicket was Mike Hussey, who was dismissed for 182 and was destined not to reach the magical 200 mark in his career. It also turned out to be Gillespie's last Test match. Despite having taken 3 for 11 in the first innings and won the match award, he was never picked again. 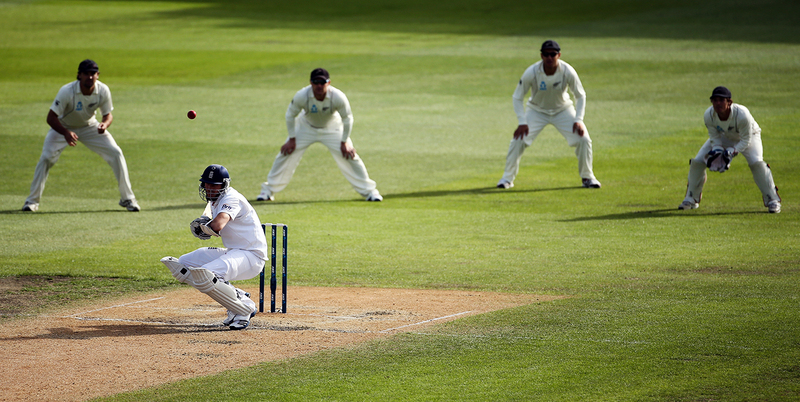 After England floundered for 167 in the first innings, New Zealand posted a huge total and secured a lead of nearly 300. In their second innings, Alastair Cook and Nick Compton made a hundred each but Cook was dismissed just before close on day four at 231. Finn was sent in as a nightwatchman. On the next day, England lost Compton early. However, Finn held on firmly and saw England through the better part of the day. He was fifth out at 386, by which time he had faced 203 balls and England had saved the Test comfortably. India had a bad opening day and were dismissed for 158 just before the close. South Africa lost Herschelle Gibbs early and Boje went in as nightwatchman. On the second day, Boje played an innings befitting a No. 3, scoring 85 runs in 198 balls. He added 161 runs with Gary Kirsten and South Africa never looked back. They won by an innings and went on to take a tough away series 2-0. This was Don Bradman's farewell series. England looked like having a very good Test, reaching 268 for 2 at close of play on the first day, with Bedser in as nightwatchman. On the second day, Bedser lasted for nearly four hours and added 155 runs with Bill Edrich. England finished at 496. That they lost on the fifth day due to the combined brilliance of Arthur Morris and Bradman does not take the sheen off Bedser's innings. There is a story going around that Bedser took strike on the first day and his twin, the better batsman, Eric, took over on the second day. A good tale to laugh over but not to be taken seriously. 5. Saqlain Mushtaq, 34 v Sri Lanka, Faisalabad, 1995 Sri Lanka put up a sub-par score of 223 on the first day. Aamer Sohail was dismissed just before the close and Saqlain went in as nightwatchman. He faced 171 balls, saw off well over three hours on the second day, and was dismissed with the total on 168. Pakistan took a useful first-innings lead of 110 runs. That they lost was due to the combined efforts of Aravinda de Silva and the Sri Lankan bowlers. Saqlain lasted 38 balls in the second innings, crossing 200 balls for the match. The nightwatchman innings selected here were a major reason for the team achieving either a draw or a win. I shortlisted close to 100 Tests using the numerical values associated with the innings. Then I shortened the list by specifically looking for matches that ended in draws or wins for the concerned team. This left me with about 50 Tests. The only method now available was a complete study of the concerned scorecard. 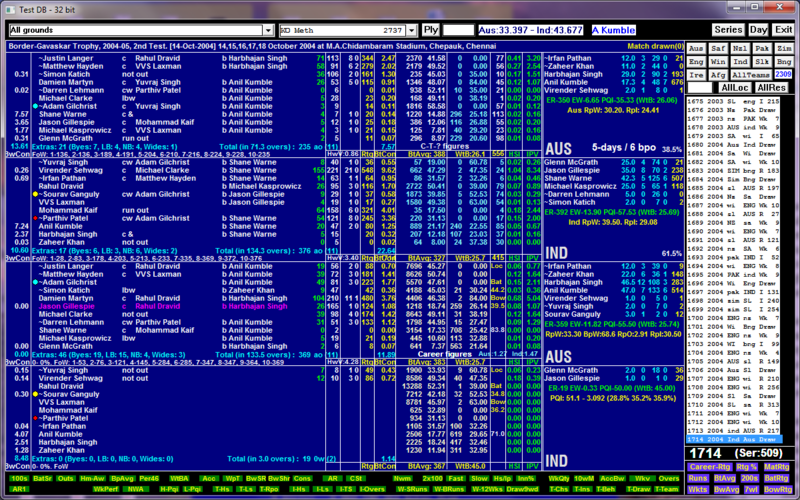 My own scorecard display, provided below, has everything about the Test in one complex view. I looked at the match situation before and after the innings, what transpired in the team innings before and after the nightwatchman innings, looked at the quality of the bowlers, the fall of wickets, the end-of-day scores, and the final result. I did these iterations three or four times to arrive at a list of five innings. These are featured below. India 2004 was a watershed tour for Australia. They finally conquered the last frontier. But on the way to this historic win, there was a major pitfall to be avoided, in Chennai, where Gillespie played no mean part in saving the Test. After the first two innings, India secured a useful first-innings lead of 141. On the third day, Australia stumbled and had just about cleared the arrears with the score at 145 for 4. Adam Gilchrist decided to send in Gillespie to protect Michael Clarke and Darren Lehmann. On the fourth day Gillespie defended beautifully and with soft hands to keep the Indian spinners out for 165 balls. He batted about four hours with Martyn before they were both dismissed at 284 and 285. Then Clarke and Lehmann batted long enough to set India a target of 229. The washout of the fifth day's play meant that the match was drawn. But if not for Gillespie's innings, Australia could well have lost the match on the fourth day. England had conceded a small lead of 77 against Australia in the SCG Test of 1983. Australia put up a huge score in their second innings and were all out just before close of play on the fourth day. England's Geoff Cook was dismissed and Hemmings went in as nightwatchman. England had to bat out six hours on the fifth day. It was essential that there was one huge innings of substance. It was Hemmings who provided that innings, not Chris Tavare, David Gower, Allan Lamb or Derek Randall. After England's first wicket had fallen at 3, there were stands of 52, 49, 51, 41 and 64. Hemmings was the man who held the innings together, facing 195 balls for 95. He was fifth out with the total on 196. By that time, England had taken major steps towards saving the match. After the first Test of the series was drawn and the second virtually rained off, India started the third formidably, posting over 500. In response Sri Lanka lost Sanath Jayasuriya just before close of play on day two. Dharmasena, sent in as nightwatchman, showed exemplary defensive technique and hung on for over three hours the following day. He faced 142 balls and was dismissed with the total on 180. After India set them a tough target on the fourth day, Sri Lanka batted out the day for the loss of seven wickets. Here too Dharmasena hung on for 58 balls; he faced 200 balls in the match, a major reason for Sri Lanka avoiding defeat. England took a useful 90-run lead in this Test. Sri Lanka scored only 250 in their second innings and England's target of 161 seemed an easily achievable one. However, they lost wickets steadily and finished the fourth day at 91 for 4, with the match very much in the balance. Alec Stewart went early the next day but Croft, the nightwatchman, hung on until after lunch and helped England eke out a narrow three-wicket win. He was the seventh man out at 142 but had done his job admirably while facing 89 balls. Pakistan recovered from 26 for 6 to 185 in the first innings. India managed a first-innings lead of 38. Pakistan were 26 for 1 at the end of the second day, with Saqlain and Saeed Anwar at the crease. On the next day, Anwar played one of the great Test innings, carrying his bat through for 188. His partnership with Saqlain, although worth only 68 runs, lasted over two hours, and was probably as important as the century partnership with Mohammad Yousuf. That Pakistan finally won only by 46 runs puts the support provided by Saqlain, who faced 86 balls, in perspective. I will now look at those who excelled in their nightwatchmanly duties. The selection is a combination of performances, their frequency, and their value to the team. Gillespie is to nightwatchmen what Bradman is to batsmen. Gillespie played nine innings as nightwatchman, scored 327 at an average of 40.9 and faced 1040 balls, averaging 116 balls per innings. These figures are better than the career figures of Paul Collingwood, Tony Greig, Sanath Jayasuriya and Stephen Fleming. There was a single failure, in which he lasted five balls. It is not an exaggeration to say that Gillespie's technique could put many a top batsman to shame. He had the softest of hands while playing defensive shots. Despite the perceptions that Anderson is a bunny, he has often taken on the nightwatchman role for England - no fewer than 20 times, in which he has scored 226 runs at an average of 11.9 and faced 658 balls, averaging 33 balls per innings. He saw through the day 15 times, which makes him a very successful nightwatchman. Saqlain Mushtaq: 11 innings, 98 runs, average of 9.8, faced 489 balls, with a balls-per-innings value of 44. Nathan Lyon: 12 innings, 113 runs, average of 9.4, faced 369 balls, with a balls-per-innings value of 31. Ishant Sharma: 12 innings, 105 runs, average of 8.7, faced 345 balls, with a balls-per-innings value of 29. Matthew Hoggard: 11 innings, 39 runs, average of 3.5, faced 251 balls, with a balls-per-innings value of 23. What good is a nightwatchman?